Frequently Asked Questions | Above and Beyond Tree Services Inc.
Are you fully licensed and insured and how do I get a copy? 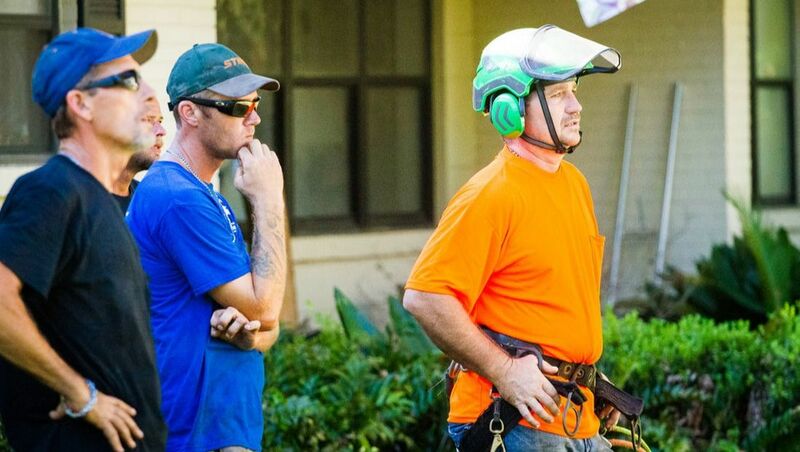 Are you bonded and do you have a state contractor’s license? What prep work should I do before having a tree trimmed or removed in my yard? How much does it cost to trim or remove a tree? Are tree cavities normal or healthy? How can I tell if my tree is dead or dying? How often should I have my trees trimmed to maintain their health? Can I trim my neighbor’s tree that is growing into my yard? Are tree stumps included in the price of removing a tree? Can a tree grow back if you leave the stump? Is there a way to prevent that from happening? What is left of the tree after you grind the stump? What is the difference between removing a stump and grinding a stump? When a tree falls over and the stump comes out of the ground, do you remove the whole thing, stump and all? Can I plant a new tree in the exact spot where I had a tree removed and stump grinded? Sign up for valuable information, specials, and notifications to your inbox. Yes, we have $1 million in general liability coverage. We also carry workers compensation insurance and commercial auto insurance. We have a business license through the city of Jacksonville. Please call or email us to request a copy of our insurance and/or business license. 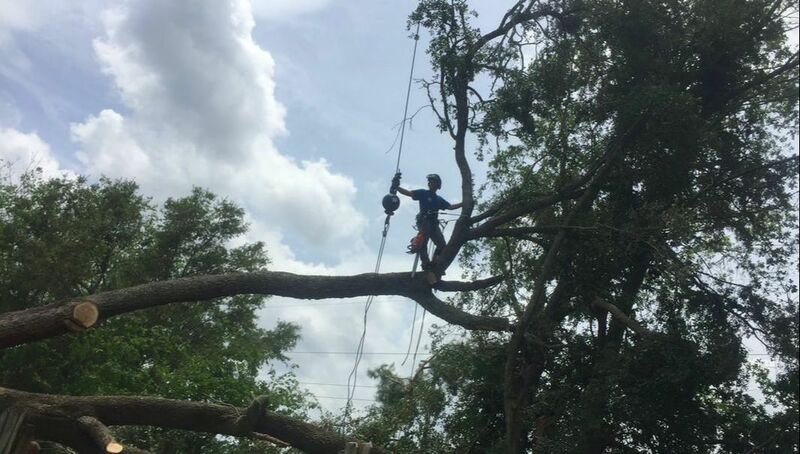 Tree service professionals are not required in the state of Florida to be bonded. Nor are they required to obtain a state contractor’s license. 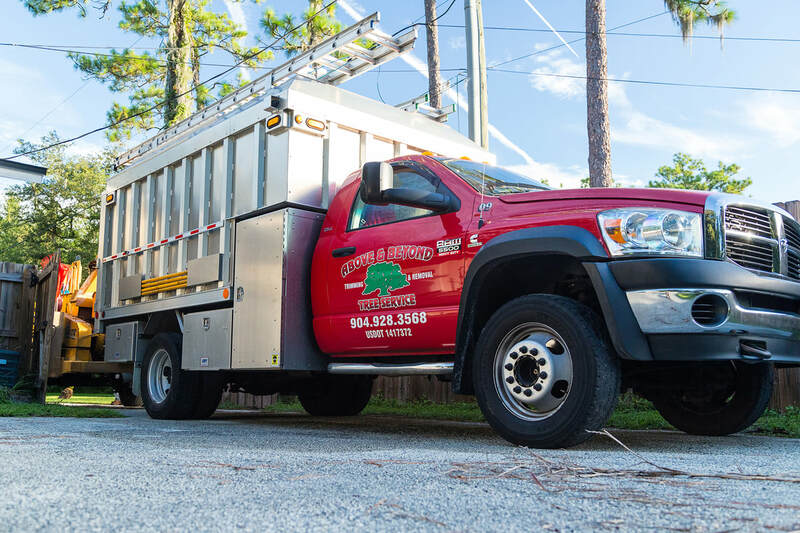 We are, however, registered as a business through Florida’s Division of Corporations under the name Above and Beyond Tree Services Inc. You can see that listing here. If you live in a community that has a homeowners association, find out under what circumstances, if any, you need to obtain an approval from your local HOA board. Each community has its own regulations and requirements. We recommend that you ask first, and don’t assume anything. The city of Jacksonville does require you to obtain a permit to remove trees on commercial property. Contact the city for more information. Other cities within Duval County do require permits to remove trees. Find out if you live in one of those cities what steps you need to take to obtain the appropriate approvals. If you are considering having a stump grinded, or, if you are concerned about having work done over certain areas of your yard, we highly recommend you reach out to your local utility company to have underground utility lines marked and consult with a septic company to mark your septic tank and system. Lastly, if you have underground irrigation lines, consider having your lawn care professionals mark those lines. It is the property owner’s responsibility to obtain all appropriate approvals and permits. It is also the property owner’s responsibility to determine and mark all underground lines. It is virtually impossible to give you an accurate price for a job over the phone, even if you provide a photo. Estimates are always free. Tree cavities are typically created when branches grow away from each other, forming a pocket, or cavity in the trunk of the tree. While tree cavities are relatively common in nature, they can lead to a decline in the tree’s health over time because an excessive amount of water can collect there and softens the tree from the inside out, making them much more vulnerable during heavy winds and rain. Dying trees usually have telltale signs such as peeling/missing bark, discolored bark or leaves, falling limbs and limbs that do not regrow leaves. Dead trees typically discolored and/or leafless. Trees have a life cycle similar to animals. There are trees in their youth, in their prime, and in their declining years. Different species of trees age at different rates. How often you should trim your trees is partially determined by the stage of their life cycle and other circumstances such as surrounding foliage, distance to structures, and personal preference. As a general rule of thumb, however, we recommend considering trimming trees once a year to maintain their health. In our opinion, you should never trim more than one-third of a tree’s foliage at one time because you take the risk of shocking the tree, which could kill it. Yes, you can trim branches from a neighbor’s tree that cross over your property line. You cannot cross the property line, however. We can give you one price to remove the tree and a separate price to grind the stump. Grinding the stump is an additional cost because it requires a separate piece of equipment and adds to the overall time spent on the job. Some species of trees can sprout from the stump after the tree is removed. Whether or not it will happen and how quickly it will happen depends on a number of factors that include the species of the tree and its general health before being removed. There are some products you can buy at hardware and home improvement stores to try to prevent a tree from sprouting, but the most reliable method of preventing a tree from sprouting that we know of is to grind it. We typically grind stumps 4-6 inches below the surface. Stump grinding produces stump mulch, which we rake back into the area where the stump was located. Over time, the mulch breaks down into soil and grass can grow back over the area. Occasionally, when we grind larger stumps, it leaves a large amount of stump mulch. Some property owners prefer to use the excess mulch in flower beds or playground areas. We can provide you with a price for hauling the mulch. Some stumps also have feeder roots. We can provide you with an estimate to grind any or all feeder roots. Removing a stump is much more time consuming, costly, and intrusive method of eliminating a stump than stump grinding, in our opinion. It requires pulling the entire stump out of the ground with a heavy piece of machinery and is much more likely to rip out portions of your yard along with the stump. With a portable stump grinder, we can grind below the surface to eliminate a stump above ground that is unsightly or a trip hazard. In some instances, during heavy wind and rain events, trees fall over, exposing a portion of or all of the root ball. We call the exposed root ball portion of the tree a blow over stump. 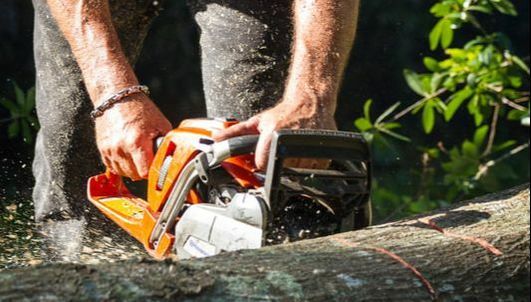 We price the fallen tree and the blow over stump separately because even though the root ball is above ground, it still requires a separate piece of equipment to grind. It is still more economical to grind the stump, in most cases, rather than to try to remove it whole. Blow over stumps do occasionally, but not always, fall back into the ground after the weight of the tree is removed. Depending on the circumstances, we usually recommend that you consider having a blow over stump grinded along with removing a fallen tree. In most cases, we do not recommend that you try to plant a tree in the exact spot you had one removed because there are likely still feeder roots, and portions of stump well below the surface that could potentially prevent a young tree from growing at its full potential because it normally takes more time for a new tree to grow around old roots. Instead, we recommend you choosing a different location in your yard far enough away to give the roots of the new tree the opportunity to take hold as soon as possible to establish a healthy beginning.